State award winners from Swanton, from left, are Seth Rains, Haiden Gombash, Tristian Gelske, and Nicholai Leninger. 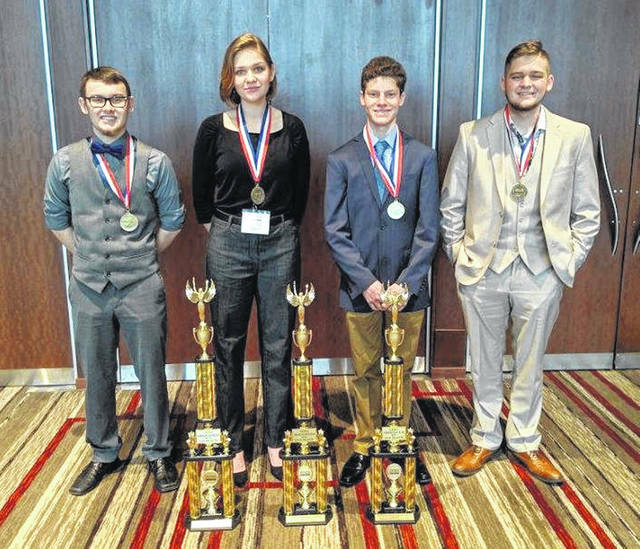 Three Swanton students have qualified for the National Business Professionals of America contest thanks to their performance at the state level. Swanton High School accounting students Haiden Gombash, Seth Rains, Zach Schaller, Nicholai Leininger, Tristian Gelske, Randy Slink and Allyssa Westfall qualified through regional academic competitions to compete at the Ohio Business Professionals of America State Accounting Contest in Columbus on March 13-15. Of the seven accounting students competing, four received All-State Top-Ten honors in their respective divisions, with three of them qualifying to represent the state of Ohio at the National Business Professionals of America contest in Los Angeles May 1-5. The national qualifiers are Rains and Gombash in Advanced Accounting and Gelske in Personal Financial Management. Rains becomes only the third student from Swanton to take a first place State Champion award with BPA. Gombash and Gelske were state runners-up. Leininger also placed in the top 10 in Advanced Accounting. Students are part of the Swanton accounting program funded through the Penta Career Center. Swanton students receive College Credit Plus college credits with their high school course work.